It's been a week since I launched my new blog and I can't thank you guys enough for the amazing support you gave me. All the comments, visits and likes made me so so sooo happy. I know there are still so many things I need to improve on in terms of blogging that's why I'm very thankful to each and everyone of you for bearing with me. And as I work my way through these things, I can only assure you that I will do my best to make Scrubs and Skirts worthy of your Internet Browse Time. Hehehe :3 So, just like what I've told you on my previous post, I'm having a little giveaway for all of you in celebration of my blog's launch. Nothing too fancy, just simple tokens of appreciation to be given to 2 of my lucky readers. Weee... I can't wait! Let's get this on, shall we? First winner will get this De-Aging Mist from Pevonia Botanica. I've tried using this before and I must say, I like its soothing and moisturizing effect. Perfect remedy for dry skin which we are very prone to nowadays due to this crazy summer heat. 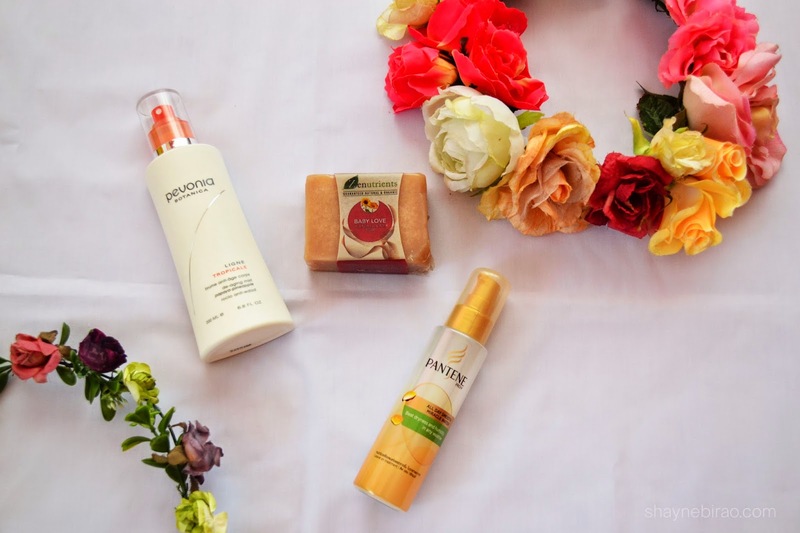 Second winner will get these Zenutrients Baby Love Calendula & Milk Soap plus Pantene Pro-V All Day Smooth Miracle Water (whew! that was long. haha). Same with the De-Aging Mist from Pevonia, these two also provide moisture and glow to your skin and hair. Haven't tried them yet but I've read quite a lot of positive comments about these products so I'm sure whoever wins these will never regret it. So, there you have it. I hope you like my simple gifts. Hehe Now, it's time for the mechanics. Below are the steps you need to follow in order to have a chance to win this lot. Please follow the instructions well coz failure to do so will invalidate your entry. This giveaway will run from May 25 up to June 14, 11:59 PM. Two lucky winners will be chosen via Random.org and will be notified thru email. I will also announce the winners on my Twitter and Instagram account on June 15. This is open to Philippine residents only. Good luck everyone! Love the photos! The flowers look very pretty! Beautiful giveaway! Lovely stuff and you had a beautiful idea!